After last night’s game of thrones, I think we’ll definitely stick to furnishing ruby weddings rather than red weddings. I can imagine that for a game of throne’s style red wedding the gift guide would need to include chain-mail, shields and the odd crossbow or two. Ruby weddings on the other hand tend to be a lot more genteel…..check out our ruby wedding gift guide below for some red wedding gift ideas! 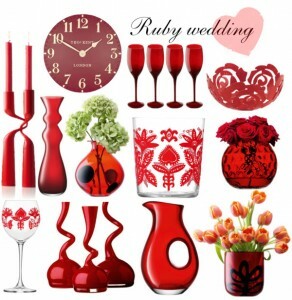 The red vases and red wine glasses also work perfectly well as complements to a red wedding theme. Think of red vases filled with red roses, pretty right?